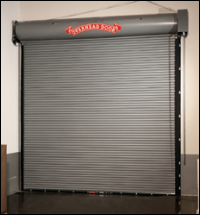 Timbers Kovar offers a wide array of rolling steel doors to meet the most demanding fire safety standards, unusual opening sizes and discerning aesthetic requirements. Designed to close automatically in the event of a fire or alarmed event, our fire-rated doors are available for service door and counter applications in commercial, industrial, institutional and retail uses. All doors comply with NFPA-80, and are listed for both masonry and non-masonry applications — including installation to wood or steel jambs within drywall. The Fire Sentinel™ time-relay release mechanism provides an added measure of safety to control the doors’ closure. 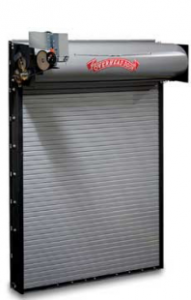 Also available is the Fire Minuteman™ Chain Reset Hoist, designed to eliminate the need to release a fire door’s spring tension on fire drop mode and allows one person to reset the door from the floor. The FireKing™ is a commercial rolling insulated fire door that offers the triple benefits of insulation, fire protection and sound attenution; this one door eliminates the need for separate fire and insulated doors. FireKing™ has many product features that enhance its performance, including: UL, FM, New York City MEA, California CSFM and Optional “S” smoke label with up to four hour labels for both UL and FM. This means Overhead Door’s FireKing™ Insulated Fire Door is available in four hours for masonry and three hours for non-masonry walls. An “R” value of 4.5 means FireKing™ serves as a thermal barrier, perfect for applications which require separation because of climate control requirements while at the same time it can be used as a Fire Door opening. The mineral wool insulation material is compressed within the slat, completely and uniformly filling the slat for maximum insulation.